What a week it's been for the Splinter Bike project. It all started innocently enough with a blog posting on the Guardian website. Before we knew it the bloggersphere went crazy and the story was all over the internet translated into just about every language too. We had over 20,000 new visitors to this website and our YouTube video went over 41,000 views. With so many requests from TV, Radio and newspapers to deal with I have hardly had time to catch breath never mind organise some trials to test out James on this newly dubbed "engineering marvel". We still need to find a suitable location to conduct the land speed record and raise the cash to pay for it. Many thanks to all our supporters for pledging a pound or two in our fund raising pot. The best thing to come out of this media frenzy is... 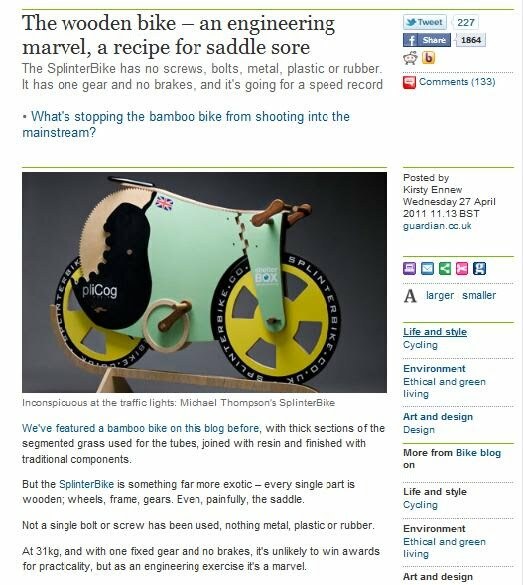 I have been asked by the Victoria & Albert Museum if we can lend them the Splinter Bike to be included in an exhibition called "Power of Making" which will be starting in September 2011 until January 2012. The exhibition will then tour the UK from February 2012 to February 2013. It's free entry so everyone will be able to view it in the flesh, or should I say wood?